Hurricanes Harvey, Irma and Maria hit the USA with impressive destructive force in a short period of time in 2017. Despite many similarities, the storms had different effects, with the c. 2975 casualties attributed to Maria in Puerto Rico far exceeding those of Irma in Florida and Harvey in Houston. There has been considerable dispute in American politics since then about whether the federal government, under President Donald Trump, responded adequately to Hurricane Maria. The US federal government responded unequally to the three hurricanes, spending more money and resources more expediently for Harvey and Irma compared with Maria, ultimately detrimental to Puerto Rico with probable effects on long-term health and other inequities. All professionals and institutions, when preparing for disasters, should recognise the extent to which all aspects of public health and disaster response are subject to politics and governmental priorities and may result in differentiated governmental action not aligned with need. 2017 was a remarkable year of natural disasters in the USA. Hurricane season is nothing new, but amidst a changing climate, the severity of storms and the magnitude of their damage presents new threats and challenges to public health. Between 19 August and 19 September, three hurricanes hit the southern USA.1 Hurricane Harvey formed on 17 August 2017, and lasted over a week, with the majority of the flooding and damage concentrated in Houston, Texas, USA. Harvey caused widespread flooding and left hundreds of thousands of people without electricity. Hurricane Irma formed on 30 August, the most intense part of the storm hitting northern Caribbean islands and Key West in Florida. In the USA, Irma caused strong wind damage, intermittent electrical damage across Florida and millions of dollars in agricultural damage. Finally, Hurricane Maria formed on 16 September in the Caribbean, focusing its destruction on Dominica and the US territory of Puerto Rico. In Puerto Rico, Maria caused widespread destruction of the power grid, vegetation and housing. The storms wreaked havoc, destroying lives and infrastructure, with lasting consequences for public health, mental health and long-term physical health outcomes including depression, post-traumatic stress disorder, disability and vector-borne diseases due to prolonged flooding.2–4 What stands apart, however, and has not been discussed by the public health community, is the differential treatment received in each case from the US federal disaster response efforts. There are many different reasons why the responses may have been different—geography, disaster fatigue and/or issues of citizenship and race/ethnicity. However, most critically and irrevocably, disaster responses that differ substantially for reasons other than storm severity and needs of the affected area may affect the public health as well as the health equity of the individuals and communities living through the disaster and the recovery. This work is limited by data constraints. We used all data publicly available to establish comprehensive timelines of staff and funding directed from Federal Emergency Management Agency (FEMA) to hurricane-affected areas. However, the data was not reported by FEMA in consistent time increments. To establish more consistent timelines and complete gaps in the data, we were in contact with FEMA to request staffing and funding counts across time periods. FEMA did not respond to data requests. To examine differences in disaster responses across the three hurricanes, we focus on measures of federal spending, federal resources distributed and direct and indirect storm-mortality counts. Federal spending estimates come from congressional appropriations and FEMA records. Resource estimates come from FEMA documents and news releases. Mortality counts come from National Oceanographic and Atmospheric Administration (NOAA) reports, respective vital statistics offices and news reports. Damage estimates came from NOAA reports. In each case, we compare the responses and the severity at critical time points after the storm. Our results show that the federal response was faster and more generous across measures of money and staffing to Hurricanes Harvey and Irma in Texas and Florida, compared with Hurricane Maria in Puerto Rico. This result would be unsurprising if Hurricane Maria was less damaging than Irma and Harvey. However, Hurricanes Harvey and Irma made landfall as category four hurricanes,1 5 and Maria hit Puerto Rico as a ‘high-end’ category 4, or just below the threshold of a category 5 hurricane.6 Maria caused more damage in Puerto Rico than Irma in Florida or Harvey in Texas in terms of loss of electricity and housing destruction,1 5 6 with overall damage estimates comparable to Harvey, and greater than estimates for Irma.1 Assuming that infrastructure costs are higher in Texas and Florida, and therefore more expensive to repair, compared with Puerto Rico, the high damage estimates in Puerto Rico emphasise the severity of storm damage. Thus, assuming that disaster responses should be commensurate to the degree of storm severity and need of the population, the federal response is questionable and the degree of variation between the disaster responses is problematic. 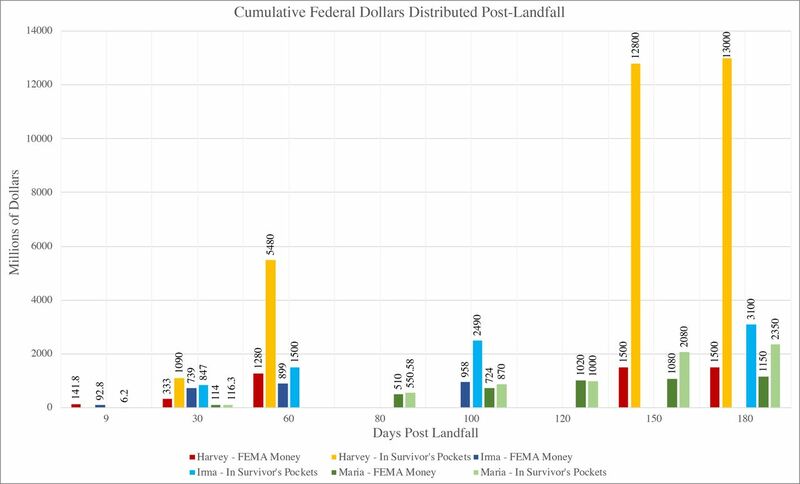 Figure 1 shows measures of FEMA dollars awarded to individuals and families by the number of days after landfall. Within the first 9 days after the hurricanes hit, both Harvey and Irma survivors had already each received nearly US$100 million in FEMA dollars awarded to individuals and families, whereas Maria survivors had only received slightly over US$6 million in recovery aid. Within the first 2 months post-landfall, Harvey and Irma survivors each received nearly US$1 billion (figure 1, Harvey US$1.28 billion and Irma US$899 million). Maria funds did not hit 1 billion until 4 months after landfall. The same trend holds for total federal dollars received by survivors, including FEMA dollars, national flood-insurance payouts and loans from the Small Business Association. Cumulative dollars scaled in millions. For example, 5480 million dollars is equal to 5.48 billion dollars. Federal Emergency Management Agency (FEMA) money refers to FEMA assistance to individuals and families.21 This includes applications by individuals currently residing in the USA post-Maria, as well as persons in Puerto Rico. In Survivor’s Pockets includes total count of federal aid to survivors by days post-landfall, including FEMA aid to individuals and families, Small Business Association Loans and National Flood Insurance payouts.22 Data references included in the online supplementary appendix 1. The authors recognise that line plots are the standard for reporting temporal data. Due to the gaps in data available from FEMA, line plots did not read well. The authors chose to instead report the data in bar charts in a series of critical time points. This figure uses all data currently available from Federal Emergency Management Agency (FEMA) hurricane recovery progress records. If data is not recorded for a marked time point, this does not indicate a zero, but an absence of that data. Data references included in the online supplementary appendix. The authors recognise that line plots are the standard for reporting temporal data. Due to the gaps in data available from FEMA, line plots did not read well. The authors chose to instead report the data in bar charts in a series of critical time points. Differences in responses to the hurricanes are also evident in the delivery and timing of federally appropriated funds to affected communities. Figure 1 above shows the delivery of part of the federally appropriated funds to affected communities as designated through intended agencies. Overall, congress responded to the disasters across the course of three separate spending bills from September to December 2017. In September 2017, Congress authorised US$15.25 billion in Hurricane Harvey and Irma disaster aid, with US$7.4 billion allocated for FEMA’s Disaster Relief Fund, US$450 million for the SBA’s Disaster Loans Program Account and US$7.4 billion for HUD’s Community Development Block Grant (CDBG) programme to support local relief for Irma and Harvey.9 The second bill was passed on 26 October 2017, providing additional supplemental appropriations for disaster relief requirements for all three hurricanes.10 The bill provided US$18.67 billion for the Disaster Relief Fund, where US$10 million must be transferred to the Department of Homeland Security Office of Inspector General for audits and investigations related to disasters and cancelled US$16 billion of the debt held by the National Flood Insurance Program.10 In this October bill, up to US$4.9 billion was allocated for Puerto Rico in the form of a Community Disaster Loan, as opposed to the CDB grants allocated in September to Texas and Florida.10 11 On 9 January, Puerto Rico was denied that US$4.9 billion loan from the October bill, for having a cash balance deemed too high to receive the loan, with the Treasury Department seeking further proof of lack of liquidity.12 The third bill, which was passed in both chambers in December but was not signed until 9 February 2018, contributed to the delayed payout in funds to Puerto Rico.13 Sec. 21 210 of the third bill established that the Governor of Puerto Rico must establish a 12-month and 24-month recovery plan14 endorsed by the Oversight Board15 established under Puerto Rico Oversight, Management and Economic Stability Act requiring monthly reports to Congress. Texas and Florida are able to receive funds without conditional approval of recovery plans. The Trump Administration often argues that the delay of money and goods to Puerto Rico is based on geographic limitations. Yet, disaster appropriation funding to Puerto Rico took over 4 months post-landfall to reach a comparable amount of money received by Florida and Texas in half the amount of time. The additional 2 months to distribute critical aid is not likely explained by geography, but likely a product of the congressional negotiations outlined above, seeking to demonstrate that Puerto Rico had no sufficient assets to deploy and required financial assistance. Similarly, federal staffing rates in Puerto Rico reached comparable levels in three times the amount of time as Texas and 30 times the amount of time for Irma. The magnitude of this variation seems difficult to explain by geography, particularly in the context of an ongoing disaster. This analysis was not able to find estimates of medical expenses or personnel supporting Puerto Ricans on the ground in the USA after relocation to mainland US after Maria struck. Many Puerto Ricans now living on the mainland were presumed to enrol in Medicaid if eligible to cover medical costs.16 17 The estimates provided here of federal dollars distributed to survivors include money distributed to all Puerto Rican applicants, whether relocated to mainland US or still residing in Puerto Rico. The data showing FEMA aid to individuals and families includes rental assistance to Puerto Ricans now living in the continental US after Maria. Indirect deaths for Maria are 6 months post-landfall,18 actual deaths may be higher over extended time frame.6 19 23 Indirect deaths for Harvey and Irma are totals; ongoing death counts after the storm are not significantly different from previous years, indicating that the totals for indirect deaths are correct.1 5 Deaths/mortality counts in the data and in the article text refer to absolute deaths (not mortality rates as number of deaths per unit person-time). Data references included in the online supplementary appendix. For Hurricane Maria in Puerto Rico, NOAA notes that the death toll is highly uncertain. The count for direct deaths by the federal government at this time is 65, with federal reports listing an unknown number for indirect deaths.6 The Puerto Rican Government and George Washington University reviewed mortality data, and in August 2019 released updated, official mortality estimates.18 Total excess mortality is used as the current, most accurate available proxy for indirect deaths from Hurricane Maria. It is a modelled number based on changes in the mortality rate predisaster and postdisaster rather than careful examination of death certificates, due to inaccuracies in reporting cause of death on death certificates in Puerto Rico. This research indicates that total excess mortality post-landfall between September 2018–February 2018 total 2975.18 The risk of death was found to be 45% higher, persisting through the end of the study period for individuals living in municipalities of low socioeconomic development,18 greatly exacerbating pre-existing health inequalities. 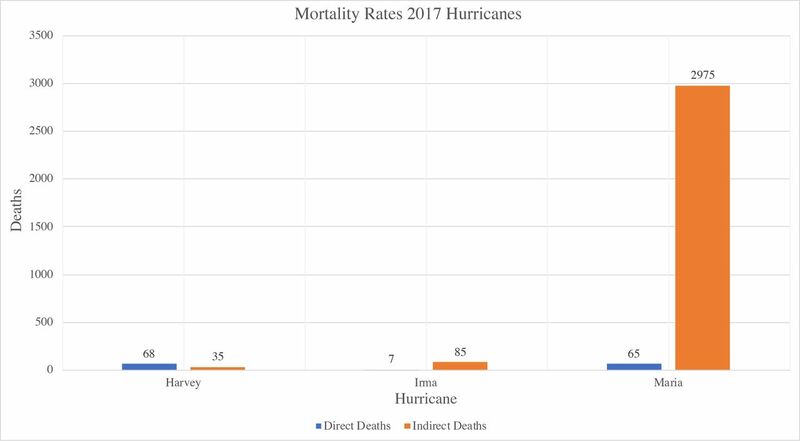 There have been no other substantial changes in acute threats to mortality besides Hurricane Maria that may account for the significant increase in deaths immediately post-landfall.18 19 Even taking the official death toll at face value, the mortality counts for Maria—as an indicator of need and severity—are commensurate with both Harvey and Irma, requiring a response at least on par with both prior responses. Considering the severe undercount of indirect deaths associated with Maria, the federal response has been inadequate. This paper demonstrates that the disaster responses to hurricanes Harvey, Irma and Maria were different to the degree that they do not align with storm severity or prevention and recovery needs and may substantially affect deaths and recovery rates. Increases in mortality and adverse health outcomes due to differentiated disaster response and recovery efforts may promote inequity among populations that receive less aid. , 2018. National Hurricane center tropical cyclone report: Hurricane Irma. Washington DC. Available: https://www.nhc.noaa.gov/data/tcr/AL112017_Irma.pdf [Accessed 17 Apr 2018]. , 2017. Public health in Puerto Rico after Hurricane Maria. Kaiser family Foundation. Available: http://files.kff.org/attachment/Issue-Brief-Public-Health-in-Puerto-Rico-after-Hurricane-Maria [Accessed 6 May 2018]. , 2017. Survey: three months after Hurricane Harvey, nearly half of affected Texas residents say they are not getting the help they need to recover. Kaiser fam. found. Available: https://www.kff.org/other/press-release/survey-three-months-after-hurricane-harvey-nearly-half-of-affected-texas-residents-say-they-are-not-getting-the-help-they-need-to-recover/ [Accessed 6 May 2018]. , 2017. Hurricane Harvey is over, but the public health impact is just beginning. Futurism. Available: https://futurism.com/hurricane-harvey-is-over-but-the-public-health-impact-is-just-beginning/ [Accessed 6 May 2018]. , 2017. National Hurricane center tropical cyclone report: Hurricane Harvey. Available: https://www.nhc.noaa.gov/data/tcr/AL092017_Harvey.pdf [Accessed 16 Apr 2018]. , 2018. National Hurricane center tropical cyclone report: Hurricane Maria. Available: https://www.nhc.noaa.gov/data/tcr/AL152017_Maria.pdf [Accessed 16 Apr 2018]. , 2018. How Trump favored Texas over Puerto Rico. Available: https://www.politico.com/story/2018/03/27/donald-trump-fema-hurricane-maria-response-480557?cid=apn [Accessed 13 Apr 2018]. , 2018. 6 months after Hurricane Maria, Puerto Rico has a suicide crisis and a housing shortage - Vox. Available: https://www.vox.com/policy-and-politics/2018/3/20/17138990/puerto-rico-hurricane-maria-6-months [Accessed 26 Mar 2018]. , 2017. 115th Congress. H.R.601 - 115th Congress (2017-2018): Continuing Appropriations Act, 2018 and Supplemental Appropriations for Disaster Relief Requirements Act, 2017. Washington DC. Available: https://www.congress.gov/bill/115th-congress/house-bill/601 [Accessed 7 May 2018]. , 2017. 115th Congress. Text - H.R.2266 - 115th Congress (2017-2018): Additional Supplemental Appropriations for Disaster Relief Requirements Act, 2017. Washington DC: House of Representatives. Available: https://www.congress.gov/bill/115th-congress/house-bill/2266/text [Accessed 7 May 2018]. , 2017. Puerto Rico Relief Bill Cancels $16 Billion in Debt — But Not for Puerto Rico. Intercept. Available: https://theintercept.com/2017/10/11/puerto-rico-relief-bill-cancels-16-billion-in-debt-but-not-for-puerto-rico/ [Accessed 7 May 2018]. , 2018. Trump administration tells puerto rico it’s too rich for aid money. Intercept. Available: https://theintercept.com/2018/01/18/puerto-rico-trump-administration-tells-its-too-rich-for-aid-money/ [Accessed 7 May 2018]. , 2018. How latest federal appropriations for disaster relief help Puerto Rico. Centrre for Puerto Rican studies, City University of New York. Available: https://centropr.hunter.cuny.edu/events-news/puerto-rico-news/congress/how-latest-federal-appropriations-disaster-relief-help-puerto [Accessed 7 May 2018]. , 2018. 115th Congress. Text - H.R.1892 - 115th Congress (2017-2018): Bipartisan Budget Act of 2018. Washington DC: House of Representatives. Available: https://www.congress.gov/bill/115th-congress/house-bill/1892/text [Accessed 7 May 2018]. , 2018. The financial oversight and management board for Puerto Rico. Available: https://juntasupervision.pr.gov/index.php/en/home/ [Accessed 7 May 2018]. , 2018. “Exodus” from Puerto Rico: A visual guide - CNN. Available: https://www.cnn.com/2018/02/21/us/puerto-rico-migration-data-invs/index.html [Accessed 9 May 2018]. , 2018. Questions and answers for displaced Puerto ricans in Florida. Washington DC. Available: https://www.cms.gov/About-CMS/Agency-Information/Emergency/Downloads/Questions-and-Answers-for-displaced-Puerto-Ricans-in-Florida-Englishpdf.pdf [Accessed 9 May 2018]. , 2018. Ascertainment of the estimated excess mortality from Hurricane María in Puerto Rico. Washington DC. Available: https://publichealth.gwu.edu/sites/default/files/downloads/projects/PRstudy/AcertainmentoftheEstimatedExcessMortalityfromHurricaneMariainPuertoRico.pdf [Accessed 13 Sep 2018]. Fink S , et al. , 2017. Official Toll in Puerto Rico: 64. actual deaths may be 1,052. New York Times. Available: https://www.nytimes.com/interactive/2017/12/08/us/puerto-rico-hurricane-maria-death-toll.html [Accessed 13 Apr 2018].
. “Let Me Next Time Be ‘Tried By Fire’”: Disaster Relief and the Origins of the American Welfare State 1789-1874. Northwest Univ Law Rev 1998;92:967–1034. , 2018. Individual disaster assistance. Available: https://www.fema.gov/individual-disaster-assistance [Accessed 7 May 2018]. , 2018. Texas Recovery - 6 months later. Washington DC. Available: https://www.fema.gov/media-library-data/1519150188718-00ea9f384981b7f8bd9c4e1eaab98493/Feb20_6MonthInfoGraph.pdf [Accessed 13 Apr 2018].
. Counting Deaths And Making Deaths Count Island officials have struggled to capture Hurricane Maria’s full impact in mortality statistics. Health Aff 2018;37.